They’re easy enough for kids to make and yet elegant enough to serve at your next fancy brunch! 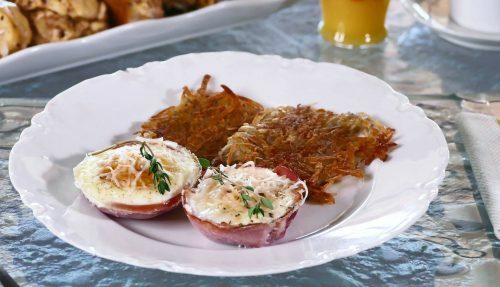 They’re called Ham and Egg Brunch Cups, but you can also make them with sliced turkey or salmon. I love this recipe because it’s so simple and looks gorgeous on a plate. I’ve included a fantastic recipe for crispy hash browns and a simple way to “fancy up” store bought refrigerated cinnamon rolls. These delicious Brunch Cups are my new favorite way to say Good Morning! Watch my How To Video for Ham and Egg Cups Here! Preheat oven to 350 degrees. Spray cupcake tin or ramekins with non-stick cooking spray or grease with butter. Line each cup with a piece of ham, turkey, or several pieces of smoked salmon. Ham, turkey or salmon should cover the bottom and sides of the cup. Break an egg into each cup. Pour one teaspoon of milk or cream on top of each egg. Sprinkle with salt and pepper to taste. Bake for about 12 minutes or until egg whites are opaque and eggs are done. Remove egg cups from oven. Sprinkle with tablespoon of shredded cheese or a piece of sliced cheese. Garnish with herbs. Serve immediately. Here’s a great way to fancy up refrigerated cinnamon rolls. Remove the dough from one canister of Pillsbury Cinnamon Rolls. On a cutting board, gently push the slices together and with your hands, roll them into one continuous log until there are no visible seams in the dough.. With scissors, snip the top part of dough to about three quarters of the way down. Arrange the cut sections so that each sections leans on opposite or alternating sides. Spread the pieces apart, alternating sides. 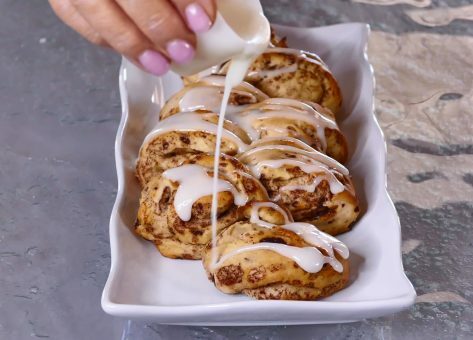 When rolls are done, drizzle with icing and serve. The secret to these perfectly crispy hash browns is letting them cook without disturbing them! I know the tendency is to keep flipping, but don’t! Trust me! Roll shredded potato up several paper towels and squeeze tightly to draw out the moisture. Repeat with fresh paper towels if needed. Place shredded potato in a bowl. Toss with salt & pepper. Preheat a large fry pan (preferable non-stick) to medium-high. Place oil in the hot pan and swirl around. Make 4 patties of potatoes and place in hot skillet, patting them slightly to flatten. Reduce heat to medium-low and cook undisturbed and uncovered for 15 minutes. When bottom is crisp, turn potatoes over. Cook until crisp. Serve immediately.